The Broughton Archipelago Monitoring Plan or BAMP was initiated by the Coastal Alliance for Aquaculture Reform (CAAR) and the salmon farming industry in this besieged area. Numerous studies have shown that sea lice are amplified by salmon farms in the region and these infestations are contributing to the decline of pink and coho populations. Watershed Watch continue to press for the removal of salmon farms from the vicinity of all wild salmon migratory routes. Our organizations along with First Nations and others continue to pressure the industry and government to change for the better. Despite this pressure, government continues to delay meaningful change to this industry at the cost of wild salmon health. As a response to the government’s lack of action, Watershed Watch and CAAR along with the salmon farming industry designed a precautionary measure to mitigate concerns associated with the interaction between wild salmon, farmed salmon, and sea lice. Fisheries and Oceans Canada subsequently joined the initiative. 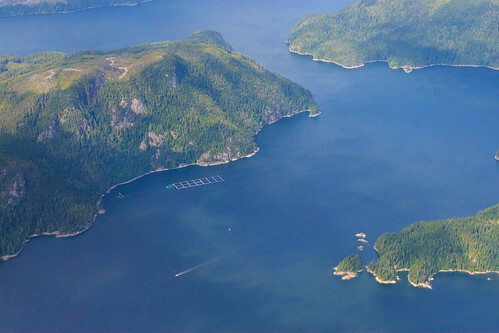 The BAMP is intended to establish safer, alternating outmigration corridors in the Broughton Archipelago for wild juvenile salmon as an interim protective measure. A six year plan was first developed in 2008 by industry in cooperation with CAAR, a key component is alternating fallowing (emptying) of open net-cage farms on either the Tribune-Fife or Knight Inlet wild migratory corridors in the Broughton Archipelago at the time when wild juvenile salmon migrate past the farms. Monitoring of BAMP in 2010 was conducted by a collaborative team made up of industry staff that monitored lice levels on farm fish and a field team lead by Dr. Martin Krkosek (currently at the University of Otago, New Zealand) which recorded lice levels on wild salmon. The entire BAMP science project is led by Dr. Crawford Revie, a University of Prince Edward Island professor. Dr. Revie will coordinate modeling with these data along with historical sea lice monitoring data from Fisheries and Oceans Canada. Watershed Watch has been directly involved in the collaboration through oversight and as part of the field monitoring program. Data sharing agreements among all participants have been developed. The preliminary results from farm coordinated management in 2009 were promising and suggest that lice levels on wild fish were reduced from previous years. Although Watershed Watch hopes BAMP will provide relief to wild fish from farm derived sea lice, we know this is an interim solution at best to the sea lice problem. Many other environmental issues engulf this unsustainable industry besides sea lice amplification. Sea lice management on farms is carried out primarily through the use of pesticides such as Slice. This chemical is fed to the fish and the use of this compound is not a long-term solution and it may have serious negative impacts on ecosystems. Worldwide, sea lice resistance to Slice has been shown to develop and it’s only a matter of time before it happens in BC. Reports from Chile, Norway and Canada’s east coast have indicated that sea lice are showing signs of resistance to treatments, including emamectin benzoate (the active ingredient in Slice), likely due to frequent and heavy applications. Open net-cages perpetuate this chemical dependency and by design cannot prevent the transfer of parasites between farm and wild fish. Long-term solutions such as permanent fallows along migration routes and an immediate transition to closed containment technology are the only long-term solutions.